King Cake with Cream Cheese Filling & Happy Mardi Gras! As I’ve mentioned on this blog before, I used to live in Louisiana. I’ve also mentioned how much I absolutely love it, but I’m just going to tell you again. It has got to be the most cultural place in America. It’s the kind of place where you go to take your trash out and end up spending the evening sharing a beer with your neighbor as you sit on the sidewalk. It’s also the kind of place where any excuse to celebrate is not taken for granted. Pretty sure there is no other place in America that gets a whole week off school in the middle of February. And most importantly, it’s the kind of place that seriously knows good food. 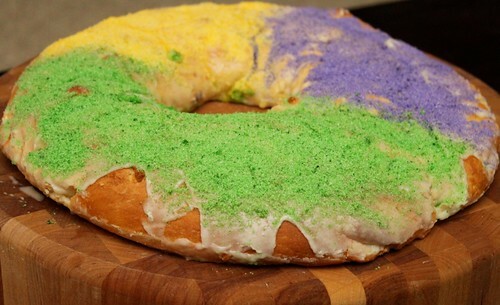 King cake is no exception. Now originally king cake was a rather plain cake filled with cinnamon and sugar, and the toppings were the really delicious part; but as we tend to do in America, we have made it more and more gluttonous over the years. Nowadays even the most famous bakeries like Gambino’s , serve cream cheese filled king cake as their “simple” selection. I’ve also heard that the bread has gotten much sweeter over the years, but I’m not complaining. This was a delicious and pretty simple recipe, even though I managed to mess it up a bit. There are quite a few steps, but each of them takes less than 20 minutes of hands on time. The problem I ran into was that I attempted to roll the dough into a huge rectangle, which made for a huge mess when I went to fill it with the cream cheese filling, but I have adapted the instructions below to make for an easier outcome. Other than that, this recipe really surprised me with how easy, and pretty much foolproof it was. I promise if you make it as soon as you get home from work, you will still be able to eat it for Fat Tuesday! 1. In a small saucepan over medium heat, add the butter, 1/4 c. of sugar and salt. Stir. Once butter has melted, add the sour cream and heat until lukewarm. Meanwhile, in a mixing bowl, add ¼ cup warm water, yeast, and 1 tablespoon of the sugar; stir. Allow the yeast to sit for about five minutes until it bubbles and becomes active. 2. Once the yeast is active, whisk in the warm butter/sour cream mixture, the egg, and 1 cup of the flour. Whisk until smooth. Using an oiled wooden spoon, being mixing in small amounts of the remaining flour until you form a soft dough. This will take about another 2 1/4 cups of flour. You want the dough to be tacky, but not sticky. 3. Using the dough hook of a mixing bowl, knead the dough until smooth and elastic, about 5-8 minutes, adding flour by the teaspoon if the dough is stickin to the sides of the bowl, more than itself. 4. Place the ball of dough into a large, well-oiled bowl, then flip the dough so all of the surface area of the dough is oiled. Cover the bowl with oiled plastic wrap, then set the bowl in a warm, draft-free area and allow the dough to rise until it has doubled in size, about 1 hour. 5. To make the filling: beat together the cream cheese, sugar and flour until smooth. Add the egg and vanilla and stir to combine. 6. Once the dough has doubled in size, turn it out onto a lightly floured surface. Lightly flour the dough and a rolling pin. Roll the dough into a rectangle about 24 inches long and 6 inches wide. 7. Dollop the filling down the center of the long strip of dough. Then fold each edge up and over the filling till they meet at the top; roll and pinch the edges together, to seal the filling inside as much as possible. Don’t worry about making the seal look perfect; it’ll eventually be hidden by the icing and sugar. 8. Place the log of dough seam side down or to the side onto a baking sheet covered with parchment paper. (A ring mold would be most helpful for this, but I didn’t have one). into the prepared ring mold, seam down or to the side (just not on top), or onto the baking sheet. The dough will be very extensible, i.e., it’ll stretch as you handle it. So pick it up and position it in the pan quickly and gently. Pinch the ends together to form a ring. Cover and let rise for about an hour, until it’s puffy. Preheat the oven to 350°F while the dough rises. 9. Once risen, bake at 350 for 25-30 minutes. Once golden, remove from oven and cool on a wire rack for 15 minutes. 10. While the cake is baking, make the sugar. (This can also be made far in advance). Combine 1/2 cup of sugar with a few drops of food coloring and stir continously until desired color is reached. *Gel colors will also work here, but you need to work the color into the sugar by pressing against the bottom of a spoon. 10. Once the cake is mildly cool, it is tradition to poke a small plastic baby, or a dried bean somewhere in the cake. Whoever gets this piece in their cake is supposed to buy/make the king cake for next year. 11. While the cake is cooling, make the icing. Combine all ingredients and whisk until smooth. Pour over the cooled cake. Before the icing has set (ie within 10-15 minutes), sprinkle sugar over the icing in 3 equal portions. This entry was posted on February 21, 2012 by Spice Is Nice. It was filed under Cake, Dessert, Holiday, Mardi Gras and was tagged with Cream Cheese, king cake, mardi gras, sprinkling sugar, sweet bread. Such a fun and yummy cake! Mardi Gras snuck up on me this year!!! And I have so many decorations to go with your cake 🙂 Bet you are missing NOLA this week!!! !